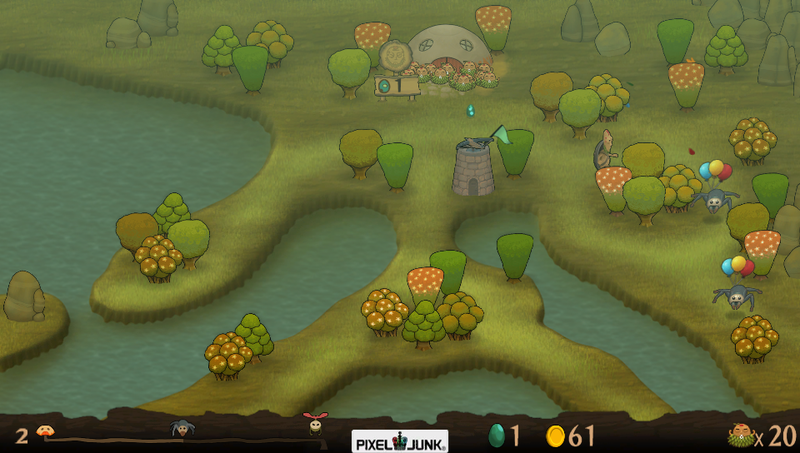 If you enjoyed the PixelJunk Monsters games back on the PSP then you will pleased to play this compilation of all the different expansions, including pretty HD graphics on Vita's beautiful screen, and some creative multiplayer portions. However, the steep learning curve and specific game style may not be for everyone. 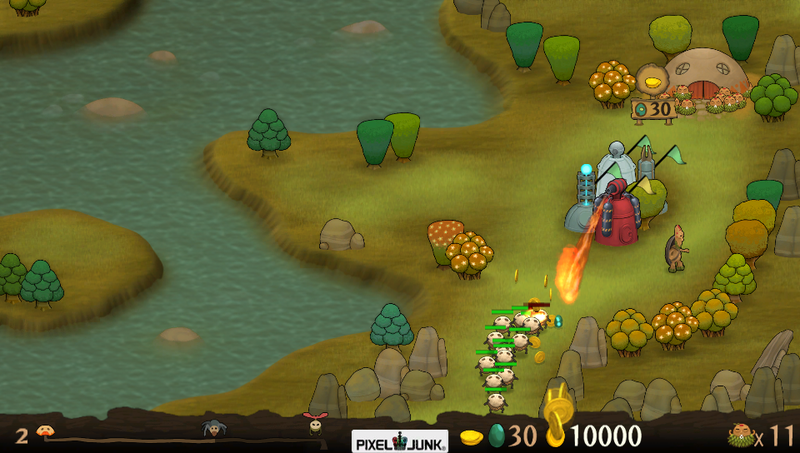 The game, like other tower defence games, has you defended your base full of babies from an ever approaching army of monsters. Who eat babies. There are many different types of creatures to fight, from standard easy to pick off marching types, to heavy ground troops, to flying swarms... and every level ends with a bigger boss to take down. You, as Tikiman, must earn coins and gems to build and upgrade towers that work better against certain enemies than others. There is a large amount of strategy needed to do well in this game, and don't expect to do perfectly on your first time. 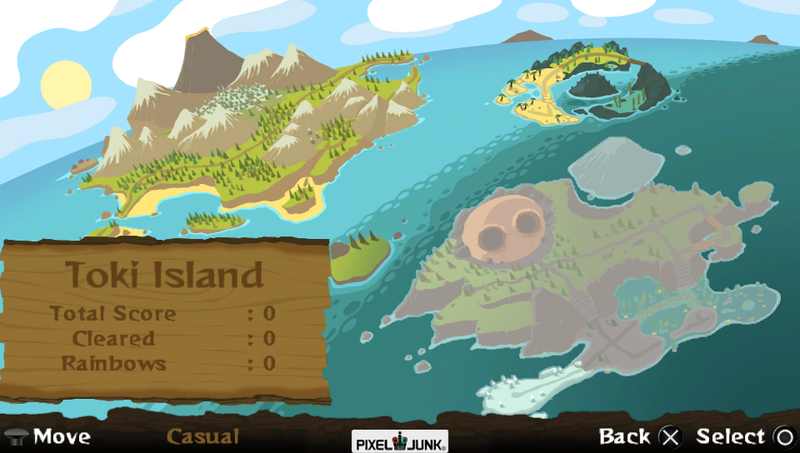 In order to unlock a lot of the later levels and islands that the game is split up into, you need to finish a level perfectly (get a "Rainbow") which means to not lose a single baby to the monsters. I mentioned the learning curve... you have a lot of things to think about, even on the casual difficulty level. What type of enemy is coming next, where is the best bottleneck to set up your towers, do I save up the gems to unlock an even stronger tower... you'll be thinking constantly of a new way to complete a level. So if this strategic thinking is for you, then you may enjoy this game. The speed of the game is slower than, say, Fieldrunners, with cannons and other weapons that are responsive and quicker to both set up and use. 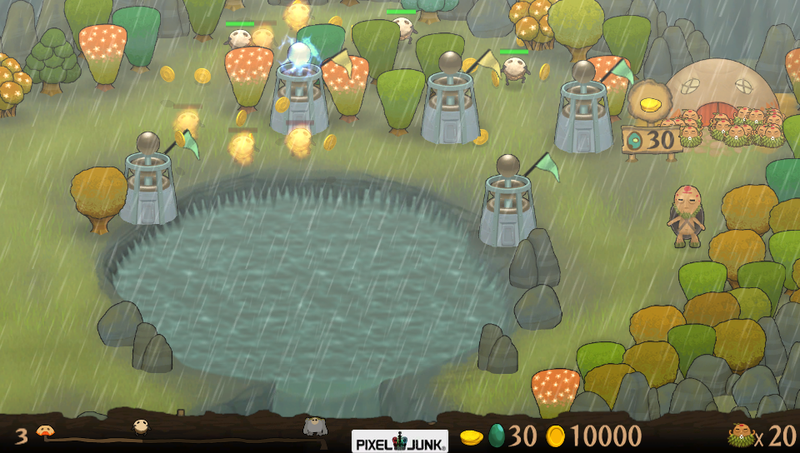 The feel of PJ Monsters is a little laid back, with the ambling monsters, serene island environment... but no less intense. You can't sit back and hope that your towers are just fine for the next wave. No, you need to make constant adjustments, upgrades, replacements, etc. Tikiman doesn't move very quickly, so if you need to get to the other side of the battle, you best plan it out ahead to beat the baddies. 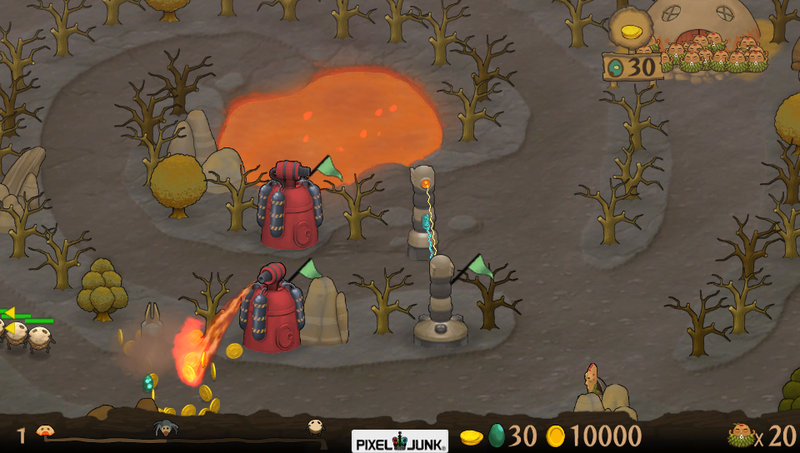 Plan to spend at least 10-15 minutes per level, depending on the difficulty. 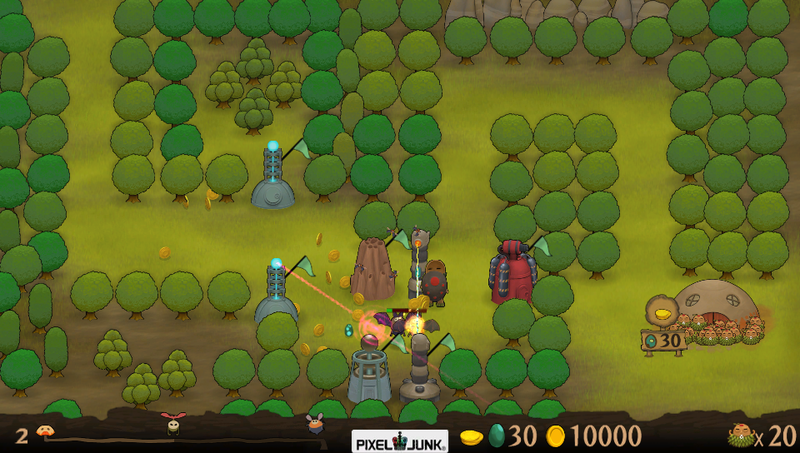 The game is touted to have 30+ hours of gameplay, online and ad-hoc co-op play and everything about all the previous editions. You can play this game online or ad-hoc with a friend. There is a strong social feel to the multiplayer aspect of the game. As with the PSP version, there is a lobby to hang out and chat with people if you see fit. You can also just set up a quick room to play a level. Chatting is limited to text and also in game there are icons you can use to communicate with your fellow Tikiman, as there is no mic support. The HD overhaul looks sweet on the Vita's OLED screen. Everything is done over in meticulous vibrant colors. The animations are nothing huge, as was in the original, but you don't need to see much motion when hordes of creatures are stomping through the forest towards your babies. Some of the advanced weapons, like the Tesla Tower, have some colorful destruction powers, though, and it feels good to mow down a would-be bunch of baby munchers with a single lightning bolt. There is a wheel system for every action you take, which makes decisions quick and easy to make, and that is important when you are quickly upgrading or tracking down coins. The soundtrack is soothing, if not a little monotonous at times. Sounds are simple, but effective. It sounds pretty immersing when you hook up a pair of headphones. The game boasts a big amount of material to get through, with plenty of challenges, trophies (both in-game and PSN), and replay value trying to Rainbow each level. The price tag is $15, with a 20% PS+ discount in the first two weeks after release. The game releases July 30 and 31st for North America and Europe, respectively. Comment below with thoughts on the game: if you are thinking about buying the game or if you played it in the past, etc.